Help Me Communicate By Lidia Sedano. 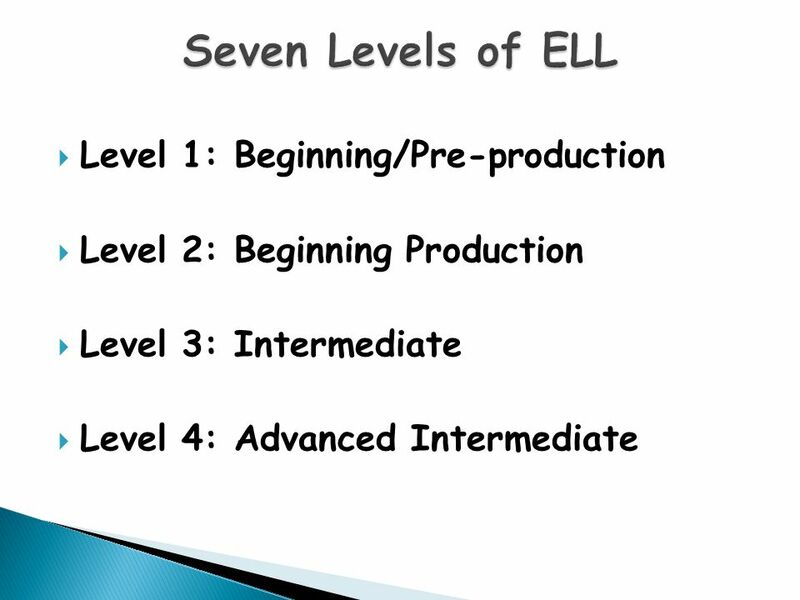  Level 1: Beginning/Pre-production  Level 2: Beginning Production  Level 3: Intermediate  Level 4: Advanced Intermediate. 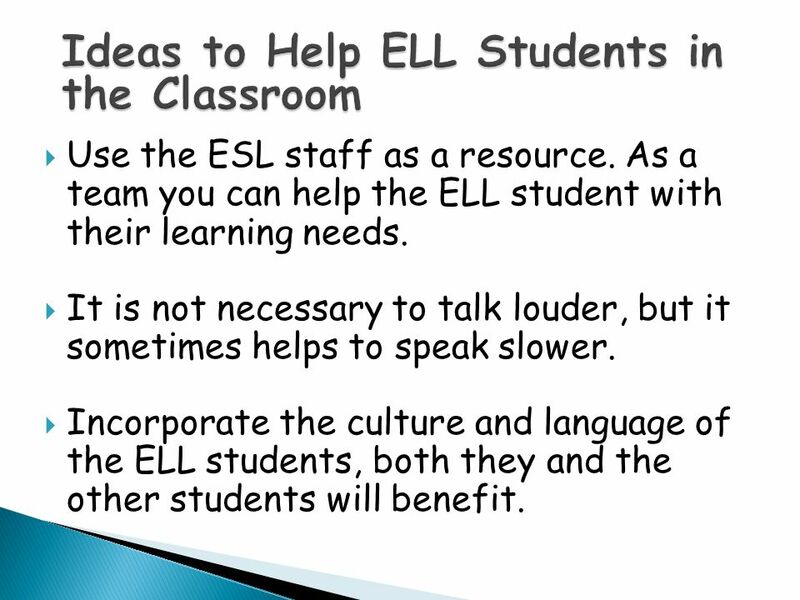 7  Use the ESL staff as a resource. 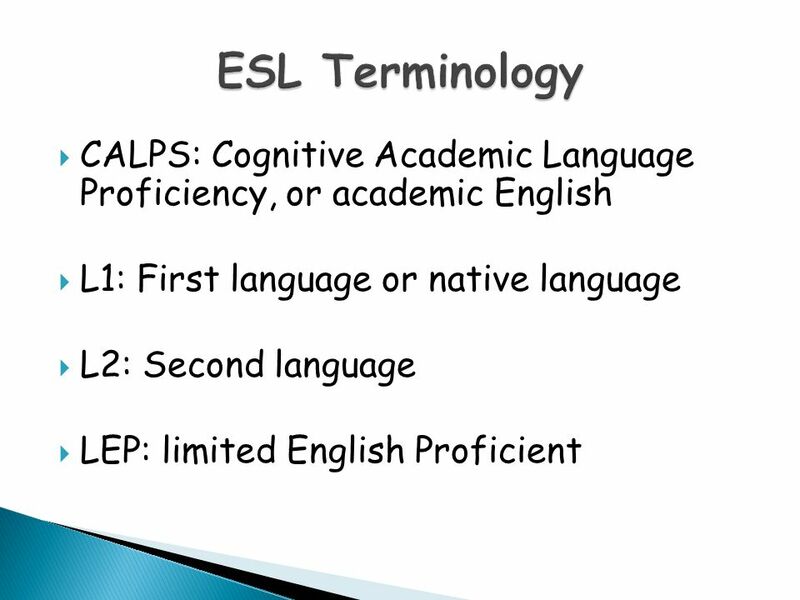 As a team you can help the ELL student with their learning needs.  It is not necessary to talk louder, but it sometimes helps to speak slower. 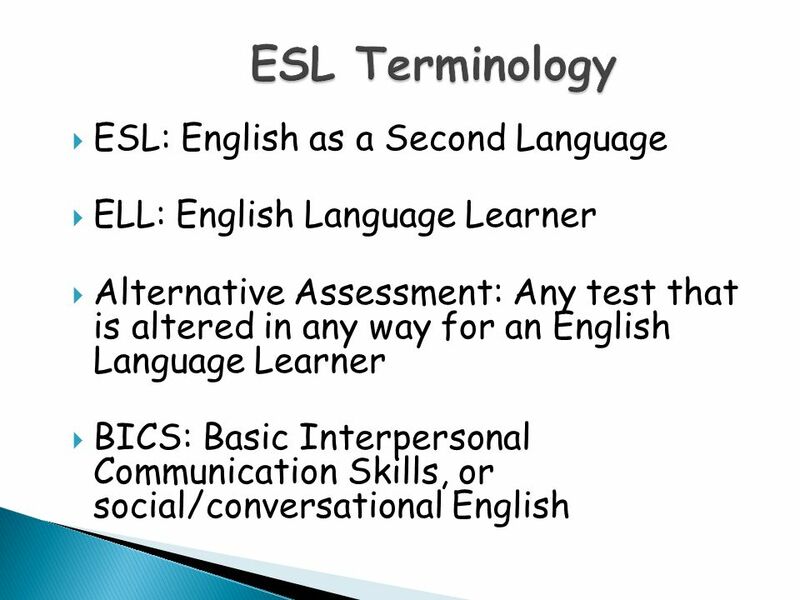  Incorporate the culture and language of the ELL students, both they and the other students will benefit. 8  Be aware of cultural differences.  Use gestures and visual aids when you teach.  Use graphic organizers and Venn diagrams. 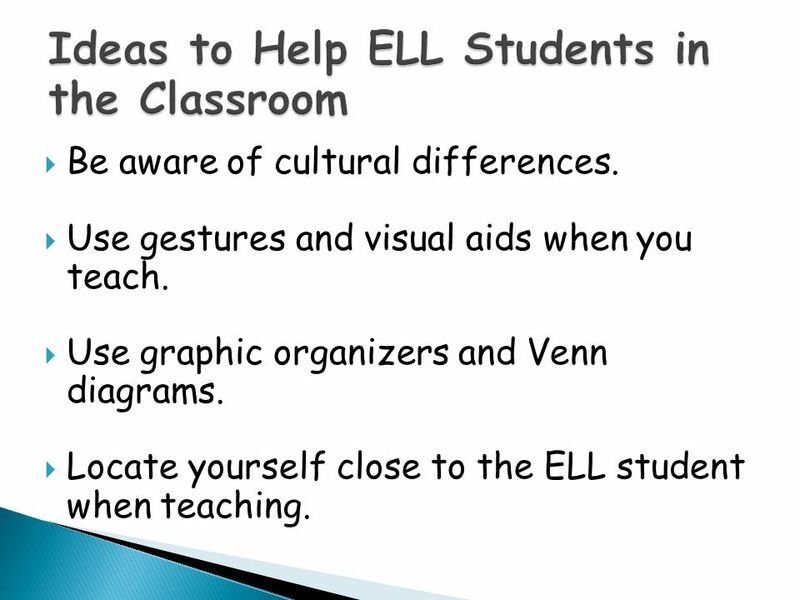  Locate yourself close to the ELL student when teaching. 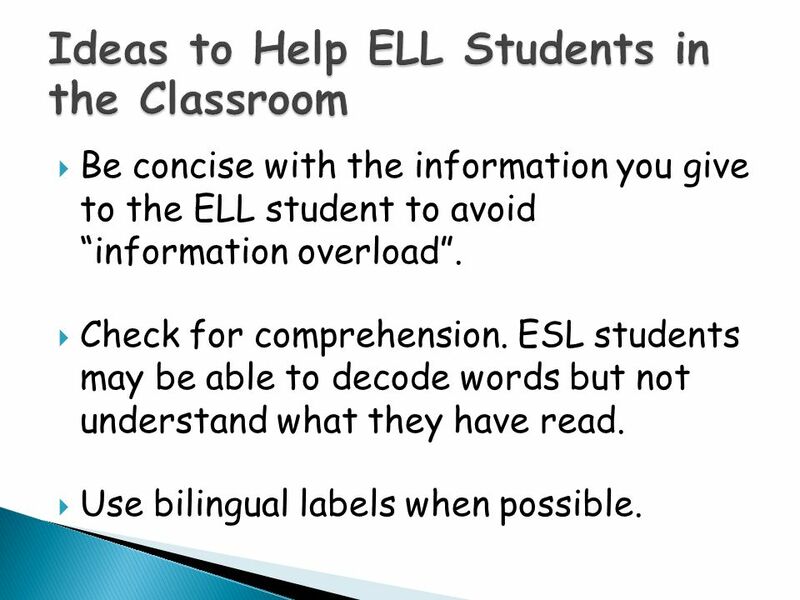 9  Be concise with the information you give to the ELL student to avoid “information overload”.  Check for comprehension. ESL students may be able to decode words but not understand what they have read.  Use bilingual labels when possible. 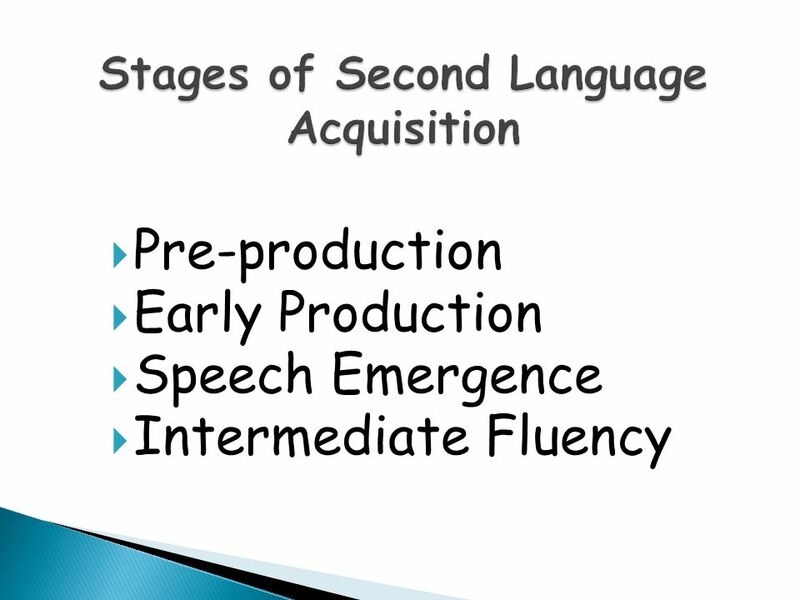 10  Phonemic awareness may be challenging for ESL students who have not acquired the English sound system.  Integrate reading, writing, speaking and listening in real life contexts.  Make a sheet of important vocabulary related to what you are teaching. 11  Label important content words in your classroom. 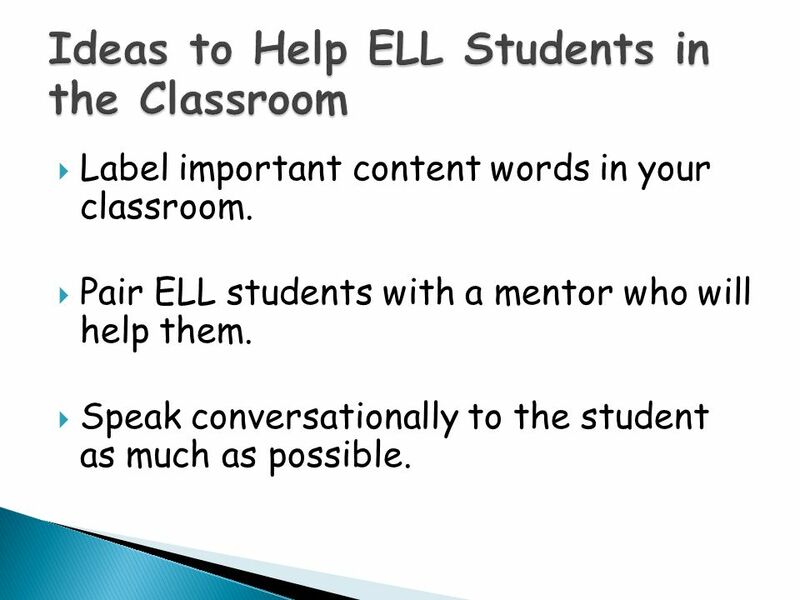  Pair ELL students with a mentor who will help them.  Speak conversationally to the student as much as possible. 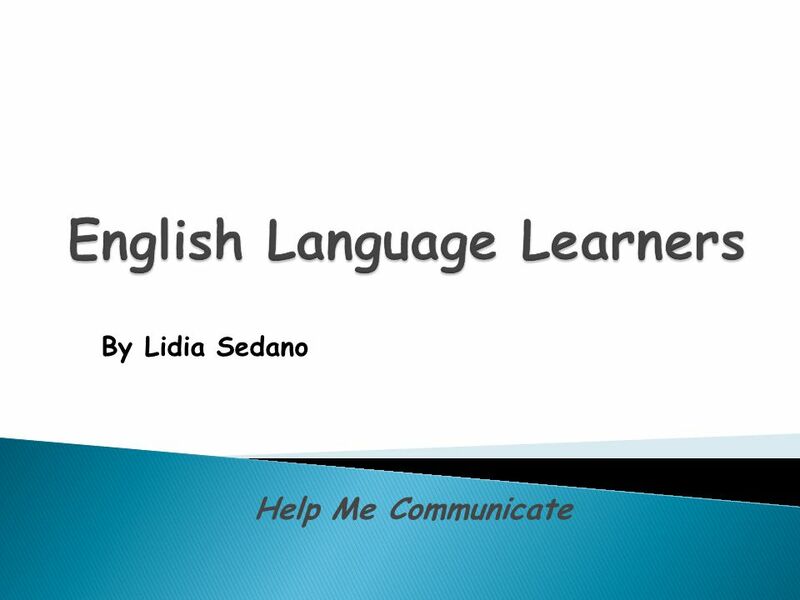 Download ppt "Help Me Communicate By Lidia Sedano. 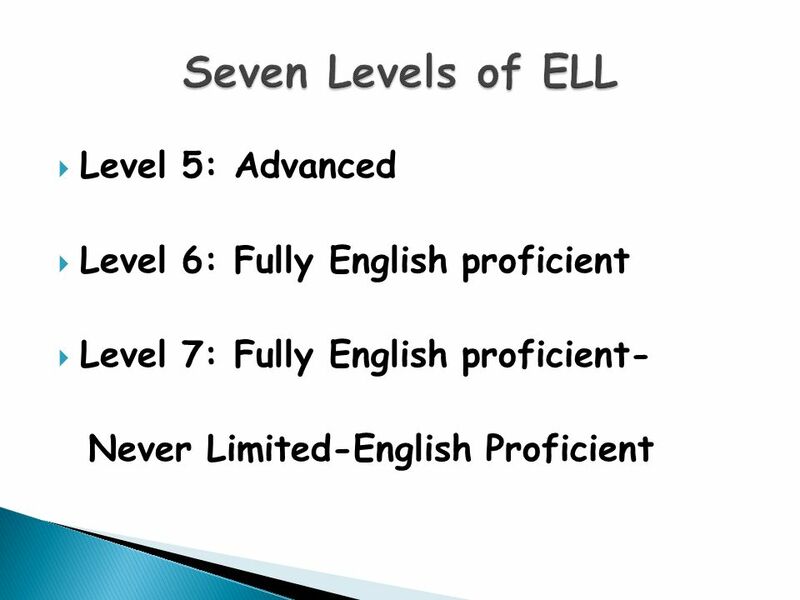  Level 1: Beginning/Pre-production  Level 2: Beginning Production  Level 3: Intermediate  Level 4: Advanced Intermediate." Making the Connections Effective Strategies for ELLS Cleveland County Schools K-2 December 2008. The SIOP ® Model Understanding the English Learners in your Classroom. 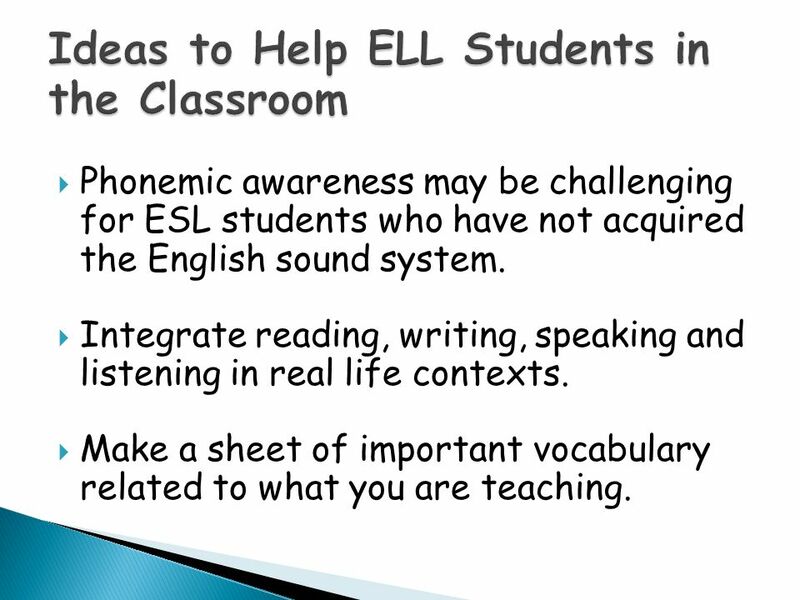 Modifications For ELL Learners in the Regular Education Classroom Useful Teaching Strategies for Successful Integration of English Language Learners into. An Overview of Teaching Meghan Kurtz EDU 415/515. Features of Effective Instruction Assessing Progress Designing Instruction Scaffolding Continually examining student data from both formal and informal. Deb Drescher Warren County Public Schools. Warren County Public Schools’ Title III (ELL) program is now in school improvement status and has identified. 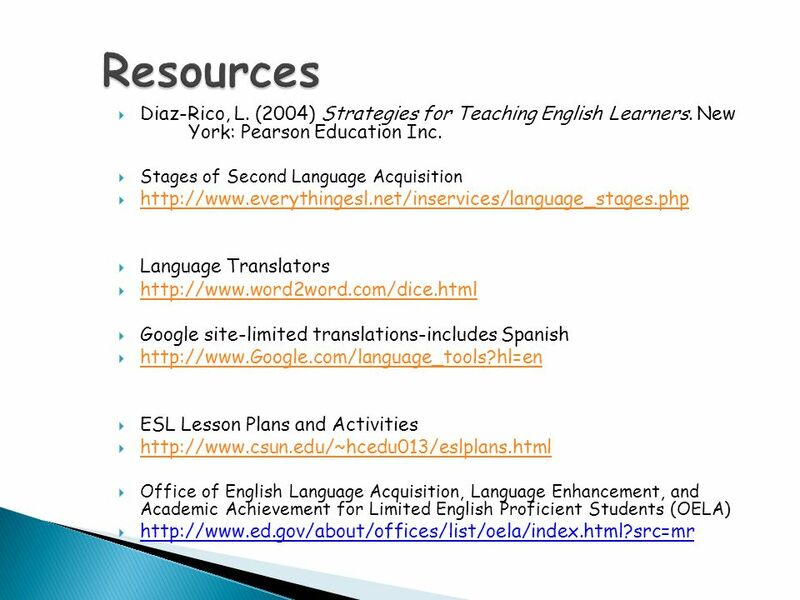 Using Your ELDA Results to Serve English Language Learners.